The inaugural Dodge City 300 was held on July 4, 1914 on a 2-mile oval dirt track located northeast of town. This was an officially sanctioned event of the FAM (Federation of American Motorcyclist) and all the usual manufacturer backed teams were present. These included Indian, Excelsior, Pope, Thor,Flying Merkel and for the first time Harley-Davidson. Harley's last minute entry into the race came as quite a surprise since they had maintained that they did not build racing machines. In fact, Harley-Davidson's Vice President, Arthur Davidson, had written several strongly worded articles against racing as late as 1913. Certainly there had been plenty of racers who had used Harley-Davidson's, but these were always stock motorcycles without any backing from the factory. This seemingly sudden change in attitude was probably due to the boost in sales that Indian and Excelsior enjoyed every time they won a major event. Harley-Davidson needed to win races in order to compete on the sales floor. Although Harley entered the Dodge City 300 at the last minute, they had been preparing for their racing debut for at least a year. This started in 1913 when they hired Bill Ottoway away from Thor Motorcycles. 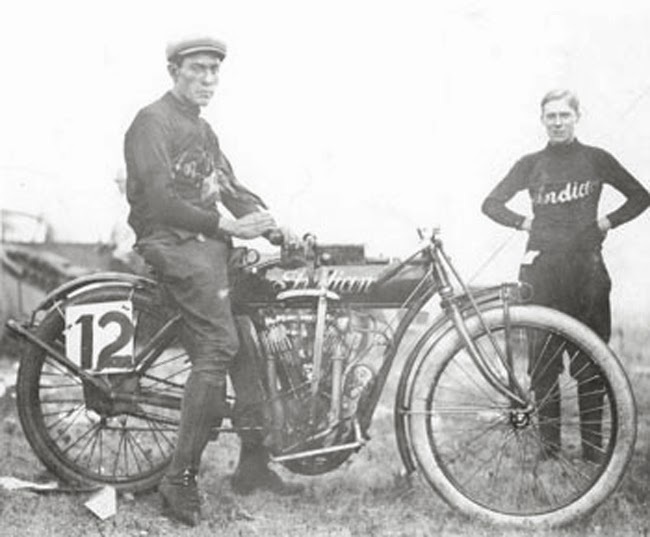 Ottoway was a talented motorcycle race tuner and Harley put him to work tuning their V-twin motor which had been introduced back in 1911. The result was a new race ready model named the 11-K.
Ottoway personally tuned twelve 11-K models for the Dodge City 300 for use by Harley's five man team: Walter Cunningham, Paul Garst, Paul God, "Red" Parkhurst and Alvin Stratton. Stratton, Garst and Cunningham are pictured below at the start of the race. By the end of the race, only two of Harley's racers made it across the finish line. Harley did have a strong showing, being tied for first place with Glenn Boyd at the 120 mile mark, but they were not able to keep the pace for the entire 300 miles. In the end, the victory was claimed by Indian and their big 8 valve twin, piloted by Glenn Boyd. Second went to Bill Briar who coincidentally was riding a Thor motorcycle that had been tuned by Ottoway before he left to work for Harley-Davidson. 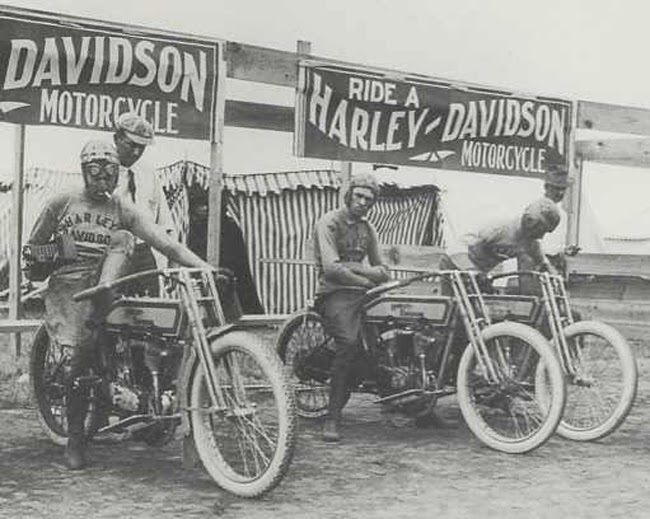 This was only the beginning of racing for Harley-Davidson who came back to win the Dodge City 300 in 1915. Then to prove this wasn't a fluke, they won again in 1916, 1920 and 1921.